Devin Powell (right) looks to punch Team Irish MMA Fitness Academy's Jon Lemke during their catchweight bout as part of the reality program "Dana White: Lookin' For A Fight" event at the Cross Insurance Center grand ballroom in Bangor in this Aug. 5, 2016, file photo. 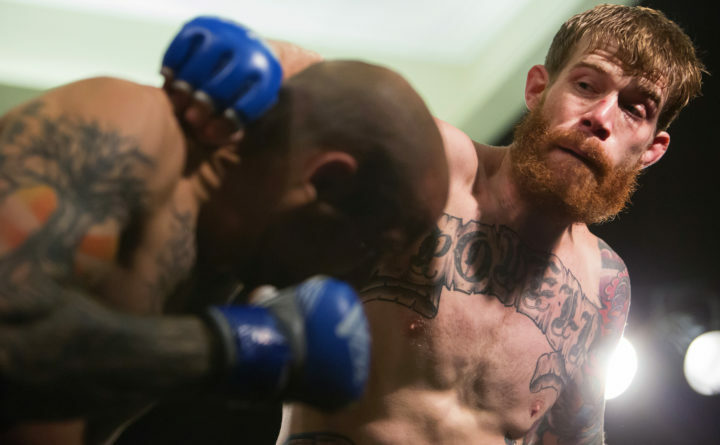 BANGOR, Maine — Devin Powell was back at the scene of the second-most important fight of his mixed martial arts career Saturday night. Instead of competing inside the cage at the Cross Insurance Center’s main ballroom — as he did in August 2016 while earning a Ultimate Fighting Championship contract with his performance at a “Dana White: Lookin’ For A Fight” show — Powell was offering encouragement as two of his MMA students scored victories during a New England Fights promotion. “We don’t have a ton of guys, but we have a bunch who want to fight who are close to getting their first fights, so it’s exciting,” said Powell, who lives in Wells and owns Nostos MMA in Somersworth, New Hampshire. Powell has parlayed his high-energy brand of fighting into a whirlwind early run in the UFC, including his first win with the world’s top MMA promotion July 28 when he scored a first-round, technical-knockout victory over Alvaro Herrera in Calgary, Alberta. He had lost his first two UFC fights. That victory provided a measure of security for Powell, who had one more fight left on his original UFC contract. Instead, the 6-foot, 155-pound lightweight was awarded a new four-fight contract that is scheduled to commence with a Nov. 17 bout against Peruvian Claudio Puelles on a UFC Fight Night card in Argentina. Powell (9-3) won the New England Fights lightweight title before overcoming a broken nose and torn knee ligament to score a first-round win over Jon Lemke during the 2016 show in Bangor co-promoted by NEF and White, the longtime UFC president who graduated from Hermon High School and maintains a residence in Levant. White soon signed Powell to a UFC contract, but when Powell lost by unanimous decision to Drakkar Klose in January 2017 and by split decision to Darrell Horcher five months later, his future in MMA’s major leagues was in jeopardy — despite the fact those two foes have a combined 22-4-1 record. Powell turned to social media to make his case and help build his fan base. Powell also believes he benefited from the publicity he received from a unique injury, a ruptured testicle, he suffered while training with Lauzon in February. Powell recuperated from the subsequent surgery and eventually took the Herrera fight on 30 days’ notice. He made the most of that opportunity, using two devastating left kicks to the back to prompt the bout’s stoppage at 1:52 of the first round. Powell earned $24,000 ($12,000 to fight, $12,000 to win) for the first victory at the top level of his chosen sport.